Welcome to our home turf and The St. Petersburg Grand Prix. 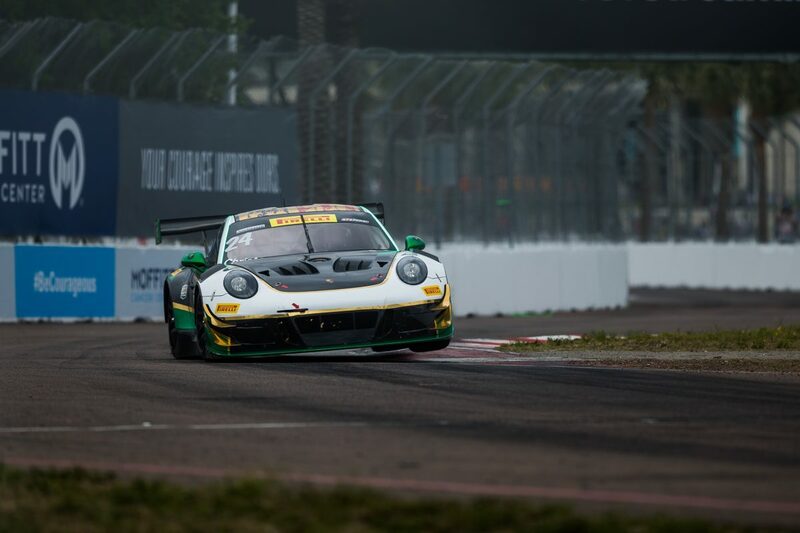 This was our first outing in Pirelli World Challenge and while we are confident about the 2018 season, we also understand there is a learning curve ahead of us. Our qualifying session showed promise with Michael Christensen securing a P2 spot for the start of the race. In this street circuit, you want to get a front row seat on the grid as it’s a narrow track and the quality of competition here means that passing opportunities will be far and few in-between. The start of race 1 set the tone for the weekend. At the drop of the green flag Michael Christensen found himself in a battle even before the first turn. About four or five cars attempted to make that right-hand turn (which as room for about two). The laws of physics took over, and by turn 2 three cars had been knocked out. Micheal somehow managed to keep the car clear of the wreckage, although there were bruises on our number 24 car as a result. The accidents forced us into 4th place. After the 50-minute sprint race was completed, we crossed the finish line in 5ht. Not where we wanted to be. However, our Porsche 911 GT3 R was in one piece. While the start of race 2 would be more subdued, the same cannot be said for the rest of it. All told there must have been about ten minutes of green flag racing. After starting in 5th, Michael managed to get the number 24 car to 4th. As we were progressing through the field, and after several yellow flags, a competitor lost his breaks and hit the wall causing a red flag (he was OK!) The race would end under these conditions. A P4 finish for Alegra. While this wasn’t quite the result we were looking for, we had an absolute blast on what could be considered our home track. Our team sponsor, InSync Health Care Solutions, brought out their staff and we had a great time showing them the behind the scenes of motorsports. On to the next. See you at CoTA.